This Noel Coward classic is the story of a refined English gentleman whose life becomes haunted by the reappearance of his former wife’s spirit, after a séance conducted in his home. Hilarious complications arise when the medium, Madame Arcati, is unsuccessful in her attempts to return the spirit to the other world. The production is directed by Jorge da Costa, former producing director of the San Jose Civic Light Opera. 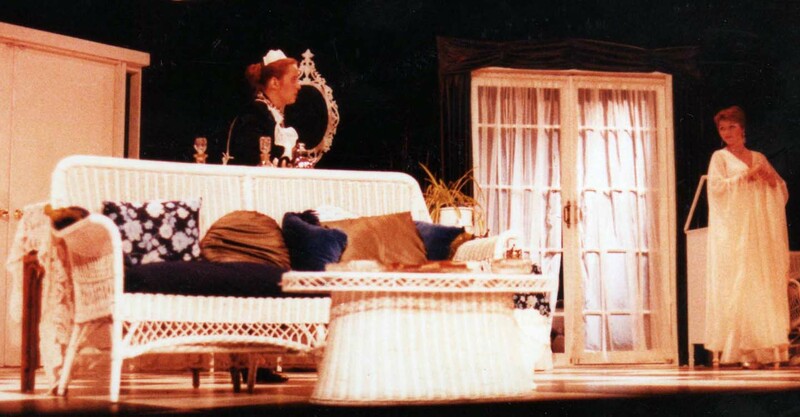 It features a magnificent set design created by Ed and Marie Perkins. Starring in “Blithe Spirit” are Joe Kirk as Charles, Betsy Andrade as Madame Arcati, and Carol Maya and Sharon Nedden as Charles’ wives. Also featured are Sandra Rapazzini, Cal Schlesinger and Karen Thorsen. Following the closing night performance, the Theater Angels Art League will host a champagne reception for the cast at 50 W. 5th Street.